Pollution makes thunderstorm clouds bigger. Their anvil-shaped tops can warm more than other aspects of the clouds cool, leading to overall warming of the atmosphere. How much warming is still unclear, however. Photo courtesy of Simon Eugster. 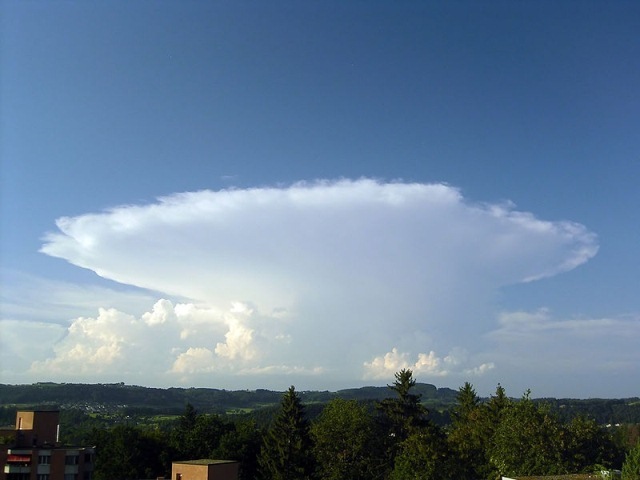 Pollution strengthens thunderstorm clouds, causing their anvil-shaped tops to spread out high in the atmosphere and capture heat — especially at night, said lead author and climate researcher Jiwen Fan of the Department of Energy's Pacific Northwest National Laboratory. "Global climate models don't see this effect because thunderstorm clouds simulated in those models do not include enough detail," said Fan. "The large amount of heat trapped by the pollution-enhanced clouds could potentially impact regional circulation and modify weather systems." Clouds are one of the most poorly understood components of Earth's climate system. Called deep convective clouds, thunderstorm clouds reflect a lot of the sun's energy back into space, trap heat that rises from the surface, and return evaporated water back to the surface as rain, making them an important part of the climate cycle. Previous work showed that when it's not too windy, pollution leads to bigger clouds. This occurs because more pollution particles divide up the available water for droplets, leading to a higher number of smaller droplets that are too small to rain. Instead of raining, the small droplets ride the updrafts higher, where they freeze and absorb more water vapor. Collectively, these events lead to bigger, more vigorous convective clouds that live longer. "Those numbers for the warming are very big," said Fan, "but they are calculated only for the exact day when the thunderstorms occur. Over a longer time-scale such as a month or a season, the average amount of warming would be less because those clouds would not appear everyday." Reference: Jiwen Fan, Daniel Rosenfeld, Yanni Ding, L. Ruby Leung, and Zhanqing Li, 2012. Potential Aerosol Indirect Effects on Atmospheric Circulation and Radiative Forcing through Deep Convection, Geophys. Res. Lett. May 10, DOI 10.1029/2012GL051851.